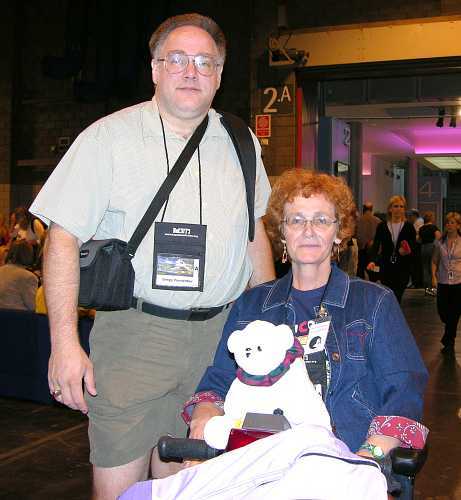 Gregg and Myrna Parmentier at Interaction, the 2005 Worldcon. Photo by Keith Stokes. MyrnaSue Parmentier, aka The Dragon Lady, passed away quietly overnight on April 26. Her husband, Gregg, made the announcement on Facebook. She was a popular longtime fan who lived in St. Paul, MN. Over the years she was fan guest of honor at Demicon, Icon, ConQuest, Contraception and Malestrom. Professionally she was a physical therapist. Outside of fandom her interests included aviation – she was a member of the Minnesota Chapter of The Ninety-Nines, the International Organization of Women Pilots. This entry was posted in In Passing and tagged MyrnaSue Parmentier by Mike Glyer. Bookmark the permalink.